We our delighted to introduce our largest holiday accommodation, Hollys Cottage which is situated in the exclusive and charming Wellswood area of Torquay. Hollys Cottage sleeps up to 10 people comfortably in 4 bedrooms and has 2 reception rooms. The house is large, substantial and full of character. It was formed from the original servants wing of the adjacent Victorian villa. There is more history attached to the house, as it used to be the home of the famous Antartic explorer Ernest Shackleton. 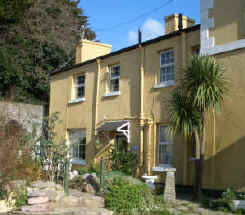 The house is within walking distance of all amenties, shops, restaurants, pubs etc. It is about a 15 minute walk to the nearest family beach, Meadfoot Beach and about the same distance from the town centre itself, where you can find all the clothes shops. The ground floor comprises an entrance vestibule leading into the large lounge with 32" widescreen TV with DVD and video. There is an original Minster stone fireplace fitted with living flame gas fire. Original solid wood block floor in herring bone pattern Three wall lights with dimmer switches and also low tableside lamps. There are two very large settees with a coffee table and a large fireside rug. The inner hall has a separate under stairs WC and replica patek philippe nautilus watches washbasin. There is also a cupboard under the stairs for access to an ironing board and iron. There is a large dining room with an eight place setting dining table with eight chairs. Original pine stripped floors. The kitchen is large and fully fitted with washing machine, fridge, freezer and microwave with beech wood effect laminate flooring. There is also a portable colour TV. A door leads out from here to the rear courtyard garden with shrubs and shed and two fully reclining sunloungers and a patio table and chairs. There is also a barbeque. The courtyard garden is enclosed. The gallery style staircase leads to the first floor from the hallway. Bedroom 1 has a double bed, large fitted double wardrobe, pine dressing table with mirror and pine stool, pine bedside table and pine chest of drawers. There are also reading lamps available and a 28" colour TV with DVD and video. Bedroom 2 has a double bed with matching beech wood wardrobe, chest of drawers, bedside table and reading lamps. There is also a 26" colour TV with DVD with surround sound system. Bedroom 3 has a set of pine bunk beds and one single bed. There is also a white wooden chest of drawers and a 26" colour TV. The large bathroom can also be found on this floor, which includes a corner bath and walk in shower cubicle and toilet. Bedroom 4 is downstairs and is accessed from the bottom part of the hall. It has one set of pine bunk beds and one single bed. There is also a large beech wood chest of drawers with a useful hand wash basin and a portable colour TV. Full gas central heating and double glazing. There are two private off road parking spaces. Bed linen is provided but guests are asked to bring their own towels. A cot, highchair and 2 stairgates can be provided on request. Gas and electricity is included in the price. There is a security bond of à°¬ which is refunded after the holiday providing there are no breakages and that the cottage is left in a good state. Sorry no dogs and no smokers. Family groups are welcome at this property. luxury camping holidays in Portugal - A perfect combination of camping in nature and the comfort of a hotel room. Visit these eco friendly holiday accommodations in Portugal!